Anyone involved in adult or youth athletics – parents, players and supporters – will all need branded team clothing and apparel. With these team apparel ideas, you can create excitement, keep everyone happy and encourage more families to participate in recreational sports with sport-themed branded apparel such as uniforms, caps, t-shirts and jackets with custom embroidery or screen printing. Sports teams attract a lot of attention from larger local companies like AmeriGas or Harbinger Sign. From jerseys to balls, trophies to snacks, the sponsors’ names will need to appear on everything. Who wouldn't love having a great local sponsor on their team? But don’t just stop with baseball. There’s a sport going on somewhere all year round; from basketball to soccer, wrestling to gymnastics and don't forget bowling. When planning your sports team athletic uniforms, apparel and promotions, think about items that can be used from start of the season to finish. When signing up players to your club or league, use items like footballs, soccer balls, volley balls, etc., or other sporting equipment that can be used during games as well. 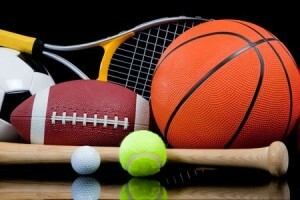 Also think of sports themed incentives, such as ball-shaped products and embroidered sports towels. During the season, players and fans will appreciate spirit flags, decals, radios to get them pumped and team pride apparel, such as performance pullovers. Of course, there’s the awards banquet at the end of the season. Give players something they will wear or display with pride. Fans, too, will love any item that will keep them comfortable during a big game, such as a portable chair so they have a front-row seat or an embroidered hat to keep the sun out of their eyes so they can have the best view of their favorite all-star. Posted in Embroidery, Promotional Products, Screen Printing and tagged cap, hats, jackets, kid's sports, sports towels, t-shirts, team apparel, team uniforms, uniforms.